50% deposit to our Bancolombia account required to secure the reservation. 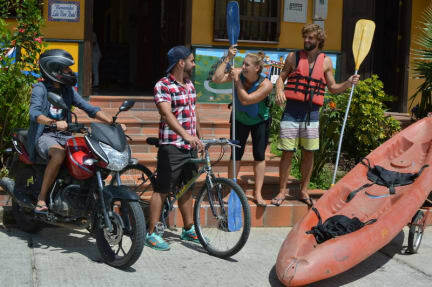 Welcome to Lake View Hostel, the first backpackers' hostel located an hour and a half from Medellin along the shores of La Represa de Guatape (Lake Guatape). Only a few minutes walk from the plaza mayor of the pueblo of Guatape, we are ideally situated to enjoy both the quaint town itself as well as all the outdoor activities in the area. We offer gourmet breakfast, a full bar and a renown Thai restaurant on the 3rd floor. 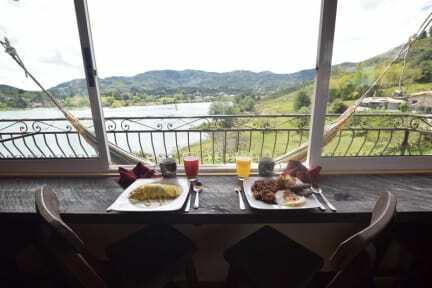 Whether you are into kayaking,paragliding, waterfall rappelling, mountain biking,moto/scooter, hiking, fishing,boat tour, swimming, or just want to chill out in a hammock and enjoy the fresh breeze blowing off the lake, Lake View Hostel in partnership with Colombia Getaway has everything covered. Dorms, private rooms, hot water and spectacular views. Lovely staff who's really helpful with organizing trips and recommendations in the area. The beds are comfy and the communal bathrooms clean. Great spot to explore the beautiful nature around Guatapé! Erg schoon hostel. Ruime kamers. Heerlijk eten op het balkon. Vriendelijk personeel. Enige note: het lake uitzicht is ver te zoeken. Prima en schoon hostel. Niet echt een hele gezellige comon area, maar er is boven een bar. We zaten net voor het regen seizoen dus echt view on the lake is er niet echt. Tours zijn gemakkelijk te boeken. Lovely stay! The restaurant is amazing. Be careful to put everything on your bill. The volunteers charge me 2 times 20000cop to much. And better ask for a dorm or room on the second floor. As it can be loud in the evening and the morning. Also the manager 'Alex' is a very grumpy never smiling guy ! For the rest wifi is good and hot showers. It was a nice stay at this hostel. Staff can help you with everything and dorms and bathrooms are good. The restaurant upstairs is also pretty good. One thing which should be improved are the mattresses. Locatie niet heel optimaal. Vind de beoordeling niet kloppen met wat je daadwerkelijk krijgt. Basic hostel, Thai restaurant was great. Location was a bit out of town. Niet altijd Engels sprekend personeel aanwezig wat het soms moeilijk maakt. Bij uitchecken nog info nodig omtrent bus, maar receptionist sprak alleen Spaans. Verder prima!